The Energy Information Administration reported that August crude oil production averaged 11.475 million barrels per day (mmbd), up 129,000 b/d from August. The gain was led by a 106,000 b/d increase in Texas, a 64,000 b/d rise in North Dakota and a gain of 24,000 b/d in Mexico. 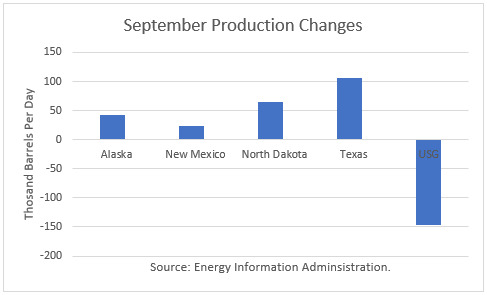 Seasonal factors affected the overall gain, as production fell by 147,000 b/d in the U.S. Gulf and rebounded by 43,000 b/d in Alaska. 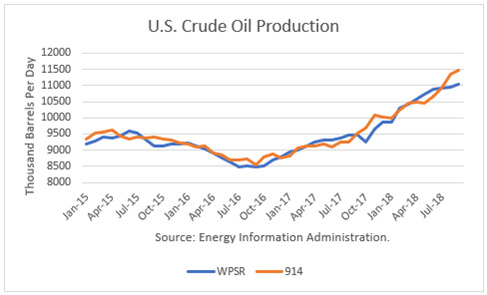 The EIA-914 Petroleum Supply Monthly (PSM) figure was 438,000 b/d higher than the weekly data reported by EIA in the Weekly Petroleum Supply Report (WPSR), averaged over the month, of 11.037 mmbd. The September figure was also higher than the 11.460 mmbd estimate for that month in the November Short-Term Outlook. The September figure was a year-over-year gain of 1.98 mmbd. And the EIA Drilling Production Report estimates a 113,000 b/d gain for December. The EIA had been projecting December 2018 output of around 11.240 mmbd for much of the year. Instead, it will be around 11.8 mmbd. 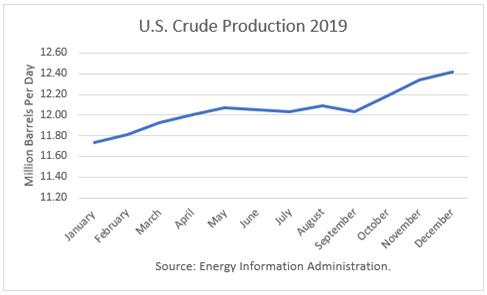 The EIA is projecting that 2019 production will average 12.06 mmbd. As shown below, the growth rate is very slow through September. According to another report, the Permian Basin is expected to add as much as 2.0 mmbd in 2019 as three new pipelines come online. And in 2020, more new pipelines are expected. Contrary to expectations by many in the past, growth in production in the Permian Basin is showing no signs of being constrained. Production for 2018 is ending much higher than previously expected and output forecasts for 2019 are likely to be revised higher in the months ahead.